Home Inflammation Does Inflammation Cause Cancer? People’s concerns about cancer and its causes are warranted. Cancer is a disease we deal with frequently in Western medicine, and it’s something we’ve kind of figured out…and still have so much to learn about. The important thing to remember about cancer is there are a boatload of factors that contribute to this monstrous disease. Factors that we’re pretty confident we understand, and then of course, those we’re still looking to figure out. Truth is, I feel a responsibility as a physician to share the information you’re about to read. That’s because most of you reading this, probably 99.9999% of you, have had a close friend or relative (or even you yourself) that’s been affected by cancer. Again, there are a lot of reasons so many people are diagnosed with cancer nowadays. Part of it is because we have better screening technology to detect this pernicious disease, other reasons are owing to our longer lives and the consequences of aging. There’s also genetic predisposition to worry about…and, of course, environmental factors. Right now there’s not much we can do to change genetic links associated with cancer risk. I’m hoping in the future we’ll be able to locate gene sequences that trigger cancer and “turn them off” so we can prevent cancer growth. And, as far as environmental concerns go, well, it’s doubtful we’ll be able to get rid of all the complicating factors that trigger cancer growth. The good news is this is one of the few areas we’re able to actually do something about cancer. And it all has to do with inflammation. Let me help simplify inflammation’s role on cancer formation and then discuss things you can do to help beat inflammation. First and foremost, it’s important to emphasize just how complicated cancer is. It’s not like there’s one single thing that causes cells to grow out of control. If there were, then cancer would have been cured years ago and I could spend more time not working. 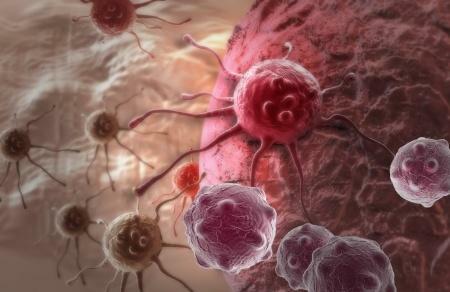 However, there’s been an exhaustive amount of research pointing to one of the most potent catalysts for cancer growth, and that’s the the role of inflammation in the body. Here’s the rub about inflammation. Inflammation by itself isn’t a bad thing. It’s actually a healthy response of your body to help heal itself when damaged at the cellular level. Without an inflammatory response you’d have died a long time ago. The problem with inflammation as it relates to cancer is that prolonged states of chronic inflammation trigger your cells to grow in a way they shouldn’t. Inflammation is a house-guest who’s stayed too long, and your body is the host who finally flips their lid at the constant annoyance of said house-guest who then loses it and starts freaking out in an uncontrolled rage. That “rage” is the abnormal and rapid growth of an otherwise healthy cell, which eventually turns into a cancerous tumor. What studies show is long-term chronic inflammation predisposes us to cancer growth. I.E. the longer that house-guest stays in your home, leaving crumbs on the couch, laying wet towels on the sheets, never washing the dishes, etc. the more likely you’ll snap and go postal. This is why things like exposure to cigarette smoke, asbestos, lingering bacterial infections like STDs, and high levels of stress can trigger cancer. Your body’s only way of dealing with these issues is an inflammatory response, and the longer and more regular that exposure is, the more inflammation. There’s also the association between microbial infections in the body, as your body’s following immune/inflammatory response can cause cancer. It’s actually believed this is the cause of 15% of cancer incidences worldwide. So that would mean if you have an infection like HPV, Hepatitis-C, or overgrowth of certain bad bacterial gut flora, you could potentially develop cancer. Then there’s what inflammation does to the DNA of the cell. It’s been shown inflammation produces free-radicals and these free radicals will cause the cell to mutate. Not in the Spiderman kind of way, but in a way where they won’t behave the way they were designed to. What happens is the free-radicals make it so the DNA doesn’t repair itself properly. When this happens your cell’s DNA goes through a process known as hypermethylation and this is frequently known to be the start of carcinogenisis or the beginning of cancer formation. It’s for that reason you hear physicians like myself recommending foods with high levels of antioxidants in them because antioxidants scavenge your body for free-radicals and neutralize them so they don’t pose as significant of a risk of causing the development of cancer (that isn’t to say they’re a cure, more a prophylaxis…or preventive measure). It’s even been noted that the inflammatory response produced by your body after a major wound occurs can produce cancer. When tissue is damaged to the point of death, the surrounding cells are forced to help with the recovery process. Sometimes the process of creating new, regenerative cells can cause cells to help create tumorous cells during the repair process. And probably worst of all, the growth of cancerous cells in the body can contribute to more inflammation in the body, which, as you might be able to tell, leads to more cancer. That’s because pre-malignant cancer cells are seen by the body as wounds, and these wounds are then reacted to with an automatic inflammatory response. Here’s the deal on inflammation and cancer. I could give you pages upon pages of research that affirm inflammation will cause and/or hasten the formation of cancer. So the next question is, what exactly is there you can do to fight cancer? The awesome news about inflammation is there’s a wide range of natural therapies you can pursue as well as products you can avoid that’ll help reduce the negative effects of inflammation. One of the first places to start is removing as many causes of inflammation as you possible can. In terms of food, I’d like to cover what I consider to be some of the most prevalent foods that make up the worst offender list. Inflammatory foods: There’s a whole slew of food out there that really exacerbates your body’s inflammatory response. You’ve likely seen me discuss these numerous times in the blog, but I’m going to give you a quick rundown on foods you should avoid if you want to keep inflammation in check. Dairy: Dairy can cause inflammation in several different ways. One of the main reasons is it contains sugar in the form of lactose. This sugar is incompatible with most people’s bodies. Some people have a strong reaction to it and others have a low-level reaction, both of which cause inflammation. Then there’s the protein matter which is problematic. Casein protein’s molecular structure is not easily broken down by our bodies and this can cause inflammation. Gluten: While there’s significant evidence pointing to people’s ability to tolerate gluten, for the most part it’s going to produce an inflammatory response in the body. It’s estimated 80% of the population displays some kind of gluten sensitivity, and this sensitivity produces an inflammatory response. Worse yet, gluten is known to promote leaky gut. Leaky gut causes permeability in the intestinal lining which can lead to excessive auto-immune responses which can cause subsequent inflammation. Refined and processed foods: The simple truth is there’s loads of evidence promoting the association between inflammation and processed foods. In most cases these foods contain inflammatory fats like Omega-6 and trans-fats as well as refined sugar which cause inflammation. Alcohol: There’s a a positive association between alcohol and inflammation. Alcohol is namely a sugar, and it’s an empty carbohydrate that can damage your body’s cells. There are numerous studies indicating alcohol can cause inflammation in areas like the esophagus, larynx and the liver. Feedlot red meat and processed meat: Now I covered this just a few weeks ago, and I want to be sure to make a preface about this. Grass-fed and pasture-raised meats are likely safe because they’re high in anti-inflammatory agents like CLA and Omega-3 fats. And if you’re eating processed meats (like bacon or sausage) coming from free-range animals, those too are higher in anti-inflammatory fats. On the other hand animals raised on a feedlot fed a diet of grain and corn (not their natural diet) and then fed a constant stream of antibiotics and growth hormones will develop a lopsided ratio of inflammatory fats that cause inflammation in the body. This isn’t a definitive list by any stretch of the imagination, but it does cover a wide variety of common foods you likely eat which are known to be inflammatory. If your diet consists largely of these foods, you can expect the level of inflammation in your body is pretty high. Outside of food, there are still a few other factors you need to know about that are known to cause inflammation. You know there are foods that cause inflammation, but there are also other activities that factor in to chronic inflammation. Here are some of the most problematic. Constant levels of stress: Your body is an amazing organism. It has the ability to adapt and overcome in a way most machines could never do. And your body’s ability to adapt to stress is one of its most amazing abilities. Your body is able to deal with stress by producing the hormone cortisol. Once cortisol is signaled to elevate to deal with stress, it’s supposed to then lower so you can continue on with daily life. For many people though, constant stress causes high levels of cortisol production and this can cause chronic inflammation. I wrote an article on this process (known as adrenal fatigue) to give you a better idea of how this works. Environment/toxins: There is a positive correlation between environmental factors like exposure to chemicals and toxins leading to cancer. It’s believed that exposure to man-made chemicals, heavy metals and other environmental phenomena can produce inflammation. I don’t want to spend too much time going over this as I’ve covered acute toxicity in depth (here and here), but anything and everything you do to cleanse yourself of toxins can help alleviate chronic inflammation. That’s a lot of stuff that causes inflammation, isn’t it? Well, you’re in luck, because I cover that it in a separate blog post coming soon.